In Vancouver, Point Grey and Kitsilano, we have many old schools that are in extreme danger of collapse in a moderate to high seismic event. My own children's school, Bayview Community School, was built in 1914. It’s a Heritage A building, which means it has significant historical value. Bayview’s age has led to both maintenance concerns (lead pipes, asbestos, outdated heating systems, etc.) and to seismic concerns. The Vancouver School Board ranks Bayview at high risk for structural damage in the case of an earthquake. Engineering reports have identified poor brick and concrete quality. The school doesn’t come close to meeting current building codes. The bathrooms look worse than the one's I encountered at a public bus depot on my last trip to Bangalore, India. Don't believe me though, watch this video. I guarantee you will be horrified. Why are our children near Asbestos? This is not the only school in Vancouver, Point Grey and Kitsilano either. To see the problem in it's completeness, study the chart below. 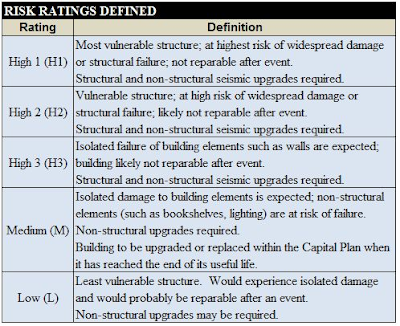 The engineers have categorized schools into five categories, H1 being the highest risk. Now take a look at this list. It turns out that the Vancouver, Point Grey, Kitsilano areas have the following schools in H1 and H3. These are the most dangerous in terms of being at risk for structural damage during a seismic event. While I applaud this action on these schools, politicians needs to make the rest a priority and pull out all the stops. Why are the Liberals spending $15,000,000 on ads claiming our job programs are working instead of creating jobs through the infrastructure upgrades? True, it is a complex logistical problem involving temporary relocation of students, compliance with proper tender processes, engineering and feasibility studies and even municipal government interactions. The fact is that this process is not happening fast enough. We have BC companies willing to bid on this work and a highly skilled workforce. The investment into this infrastructure will pay for itself (educated children become tax paying citizens) and our legacy must be higher education for our children. I also found out that apparently our Premier Christy Clark sends her son Hamish to private school. While I cannot verify this with an absolute accuracy, it seems to have substance. I live in Vancouver - Point Grey - Kitsilano with my children. They attend a public school and will continue to attend a public school. Parents in other school districts want their schools upgraded too. This cannot wait any longer. Please sign this petition. These buildings are also an important part of our community and serve as safe havens in the event of a disaster. Every school needs to be standing and equipped not only to teach our children, but to also be an integral part of our community. There are no shortages of construction materials or labour and investing into schools pumps money into our local economy. Tell you MLA that you want these schools upgraded now. We deserve this. Talk to your neighbours. Raise awareness. Write a letter to our Premier. Thank you Duane for sharing our video of the urgent need for seismic upgrades of Bayview Community School and many of our BC schools. My pleasure. This is a top priority issue that every parent needs to care about. I am saddened that in 2013, we are still even debating removing cracked asbestos wrapped pipes and lead paint from the place our most valued and cherished ones spend their weekdays in. I will fight as much as I can for this to change, not just for Bayview but for the others as well.